While the economists debate when the recession officially began or whether we are on the cusp of a so-called jobless recovery, much of their financial babble is meaningless to those who have lost their jobs.For better or worse, many of us define ourselves by what we do for work. Suddenly losing that identity often spurs a personal crisis, especially if we are not seeking just another job, but the job in our chosen field. But sometimes unemployment can mark a turning point, a spark for career transition to a life we’ve thought about pursuing only when the time is right. What if the energy devoted to marketing yourself to employers would be better spent creating a dream job for yourself? 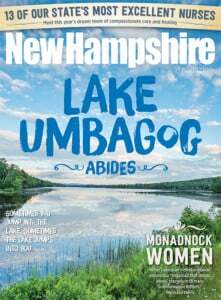 In that spirit, New Hampshire Magazine tracked down five inspirational Granite Staters in various stages of career transition and beyond. Not all of them were forced to seek dramatic change out of economic desperation. The common denominator? These people believe that true wealth is not getting rich on the job, but having a job that enriches your life. As an investigator for the New Hampshire Department of Environmental Services, Kathie Fife continuously monitored pollution levels for the state’s protected rivers. She tracked companies’ annual water use and their discharges into the waterways and also investigated the illegal dumping of hazardous waste. Fife, who worked for the state in various environmental jobs for nine and a half years, was forced to leave last June after the federal grant funding her position ran out. Fife is still very much focused on nature, particularly New Hampshire’s mountains, rivers, lakes and forests. Her art photography greeting cards, sold in tourist and specialty shops across the state, also cover historical hot spots such as Strawbery Banke and Shaker Village. The back of each card is devoted to facts, anecdotes and recipes that give her photographs context. In her wildflower collection, for example, Fife shares a spiritual camping experience in the woods of the White Mountain National Forest. “On a warm, full moon-lit night, [Kathie’s] life flashed before her eyes when a bull moose walked through her tent. Jim King has a knack for names – so much so that when he was an investment analyst for a major Boston mutual fund company he was the go-to-guy to play the omniscient Santa Claus at the annual family Christmas party. After a quick briefing of children’s names and faces, St. Nick would always act as if he had known those kids for years. Now King astoundingly absorbs the names in his herd of 140 smiling alpacas – no, they do not all look alike – and he knows all their ages, too. The 2009 baby boom on the farm was named after Broadway shows – “Carousel,” “My Fair Lady,” “Kiss Me Kate.” And other birth years are themed as well, such as the clique of Coke, Pepsi, RC Cola and Mountain Dew. In the financial world, King never imagined he would one day spend his days surrounded by hairy animals. He actually never imagined doing anything else. King and his wife, Sue, lived in Wellesley, Mass., at the time and had just bought a vacation home in rural Elkins, N.H., a year earlier. Inspired by Sue’s love for knitting, the couple bought their first three woolly alpacas with no grand plans to breed. While Jim worked as a part-time portfolio manager at a New Hampshire bank, they started bringing their animals to shows and soon got hooked. Today their Skyeview Alpacas farm sells fleece – reportedly as soft as cashmere and lighter than sheep’s wool – to clothing manufacturers and sells breeding stock at auction, where a female can fetch between $15,000 to $25,000. Best part of all: It’s OK to get emotionally attached to the animals after learning their names. “There’s no meat market for alpacas in the United States,” King explains. “Bread” and “dough” have long been used as slang for money. But self-employed accountant Shari Moskowitz may be the first one to figure out how to use carbohydrates as currency. Moskowitz, an aspiring bakery owner, pays her rent in actual bread. To be more accurate, in challah, a traditional Jewish braided loaf she hopes will become the biggest cross-cultural food since the bagel. Challah, which dates back to Biblical times, should taste more like cake than bread, says Moskowitz, who has been baking it for her family Sabbath dinners for the past 15 years. Feedback from friends at her synagogue encouraged her to launch “Challahluyah!” last October. Accounting client John Sullivan, owner of Milford’s Yankee Chef restaurant, was so smitten by Moskowitz’s challah that he offered up his commercial kitchen for the operation. For the use of the ovens after hours, the Yankee Chef asks only for enough bread to make its French toast and turkey sandwiches. Moskowitz, who harbors ambitions of eventually opening a “Challahluyah!” bake shop and cafe also has been doing double duty as delivery girl. After 13 years at a Massachusetts-based investment firm Gretchen Brown learned her employer wasn’t a role model in corporate etiquette. Last February the executive found out by reading an article in the local newspaper that she and more than 200 others were being axed. In a brainstorming session with her boyfriend’s mother, Brown first considered capitalizing on her fashion hound instincts. The upscale second-hand clothing market is now a booming industry, she discovered, especially in this economy. The whimsically named “Up Clothes & Personal” splits sales 50-50 with clothing consigners and offers everything from formal party dresses to designer jeans. About 10 percent of the racks are men’s clothing. Proulx stuck with that philosophy when he was a 12-year-old kid with a Manchester Union-Leader paper route. And he stuck with it when he was producing special promotional events for the New Hampshire Radio Network, a confederation of 16 stations partnering with local ski areas, Story Land and Canobie Lake Park to boost tourism. Last year, however, the New Jersey-based owner of nine sponsoring stations pulled its support, effectively killing Proulx’s opportunities to be likeable. “I was a 60-year-old guy out on the streets looking for a job and you can fill in the blanks on that,” he says. But Proulx’s fall had a sticky landing. For the past 14 years he and his wife Barbara had slowly built a maple sap-tapping hobby into a small side business selling syrups, candies, candles and even kettle corn. Each week the family’s goat herd also churns out 10 gallons of milk, which is quickly snapped up by locals who are lactose intolerant. Since devoting himself full time to the “Just Maple” family biz last April, Proulx claims he has doubled revenues using the same customer service skills he used in radio. He’s been concentrating efforts on large store displays and giving retailers a no-risk guarantee he?ll take back all unsold inventory at the end of the season. “Sometimes it’s not how many customers you have, but treating the ones you do have right,” Proulx says. With credit card rates soaring and banks putting the brakes on many home equity and car loans, there is an alternative funding source for start-ups and small businesses needing a relatively modest influx of capital. Microcredit-NH grants “microloans,” ranging from $500 to $15,000, to entrepreneurs who develop a business plan with one of the organization’s peer advisory groups. Microcredit-NH’s average loan amount is $3,400. The loan approval process is character-based and no credit check or collateral is required for loans less than $5,000. If you’ve been pegged for “early retirement,” perhaps you’re lucky enough to be able to live off savings or investments. But if you’re not the type to spend the rest of eternity in a rocking chair, take a cue from Wilmot’s Dana Dakin. Seven years ago, to celebrate her 60th birthday, Dakin traveled to Ghana to found WomensTrust – a micro-lending program that helps poor women who want to start their own businesses. 1. Pick a Milestone. Nothing substitutes for setting a date. Make concrete plans to dip your toe in the water. Parallel process if you’re working. And if you’re already retired, move beyond the three Gs: Golf, Grandchildren and Gardening. Honor the new G – personal Growth. It’s your time. 2. Explore New Territory. Make “advice” calls to people you admire. Have conversations with strangers, go to seminars to introduce new skills, attend retreats that pique your fantasies. Break out of your mold. Puzzled looks from friends and family are some of the most promising indicators you are on your way. 3. Challenge Doubt. Practice making the “case” for your new pursuit in front of naysayers. Honest push-back from tough questioners allows you to revisit your goal and ultimately strengthen your resolve. However, protect your dream, particularly in the early stages, from naysayers who lead with shame. Shamers love to derail good ideas. Learn how to discern the difference. 4. Passion is Your Driver. To be successful in later-life engagements requires intense passion – it propels you toward goals and gets you over hurdles. Passion gets you through the negative surprises that come with new territory. 5. “De-thing” Your Life. Reduce time and money obligations. Consciously shift from the push from your past with the pull of the future. Stand up to dependents, sell possessions, clear the deck for change. Elimination equals elegance. Elegance equals energy. And energy converts to drive. NH Made is a networking and marketing organization that promotes NH-made products and services. Members can place their products in two NH Made stores on Interstate 95 on the Seacoast, exhibit at the annual NH Made Expo in Manchester, get special low rates on credit card services, take business classes and publicize their goods or services through the NH Made Web site and directory. Annual membership is $75. Visit NHMade.com for more information. “Making $ense”The “Making $ense New England” Web site combines “expert advice with stories of how northern New Englanders are finding resourceful ways to weather the economic downturn.” The site is the online companion piece to the year-long television series “M$NE,” which was launched last October. “M$NE” is a collaboration among NHPTV, Vermont Public TV and Maine Public Broadcasting – All three stations are working together to produce both the stories and the Web content. You can watch the latest episode, discover new resources, find workshops and events near you and much more online at www.makingsensene.org.